consumption, a move that would reduce imports of American gasoline. HOUSTON — As President Trump moves to recast trade and border relations with Mexico, American oil companies are worried that the prospective winner of Mexico's presidential election will play his own nationalist card. In addition to threatening refinery profits in the United States, his proposals could slow oil production in Texas and impede deepwater drilling in the Gulf of Mexico by international oil giants like Exxon Mobil and Chevron. They would also jeopardize the United States' energy trade surplus with Mexico, which reached roughly $15 billion last year. Mr. López Obrador, a former mayor of Mexico City with leftist leanings, has a comfortable lead in the polls ahead of the July 1 vote. He has moderated his tone since losing the presidential race six years ago, but he has proposed a sweeping reorientation of the nation's energy policy with an emphasis on independence from the United States. He has pledged to end oil exports, nearly all of which go to the United States, by 2022, and to instead spend $6 billion on building two refineries that would process crude for domestic consumption. That would sharply reduce American exports of gasoline to Mexico. Mr. López Obrador and his top energy adviser, Rocío Nahle, a former legislator who is in line to become energy minister, have called for a freeze on future deepwater drilling auctions and a review of contracts with international oil companies. Ms. Nahle has said she wants the government to slash the price of electricity and gasoline, and to reduce Mexico's dependence on natural-gas imports from the United States by investing more in hydroelectric power. Any reduction in sales to the No. 1 foreign customer for gas from the United States would increase a glut that has depressed prices in America over the last four years. Such positions hark back to the 1930s, when Mexico nationalized its oil industry. Under the current government, a constitutional change enacted in 2014 let foreign companies invest in exploration, drilling, pipelines and even gas stations, and to team up on projects with the state oil company, Petróleos Mexicanos, or Pemex. The move allowed companies like Exxon Mobil to invest billions of dollars to develop vast fields offshore. Mr. López Obrador's nationalistic policies are resonating in Mexico as the Trump administration vows to curtail Mexican immigration into the United States and threatens to withdraw from the North American Free Trade Agreement. The election outlook has caused concern among American oil executives. Mr. Sheffield and other Texas oil executives are particularly worried that Mexico could slow its importing of American gas. In recent years, Mexico has replaced coal and diesel with cleaner American natural gas to produce about 30 percent of the nation's electricity. The shale-drilling revolution north of the Rio Grande has yielded an abundance of cheap natural gas for American and Mexican consumers, and Mexico announced a five-year plan in 2015 to increase imports. About 20 pipelines carry 4.5 billion cubic feet of natural gas a day to Mexico, and more are being built or planned. The gas sales to Mexico are an important source of revenue for American oil and pipeline companies, and they relieve a bulge of gas that is bubbling up with oil from the Permian Basin of West Texas and New Mexico, the nation's most prolific shale field. California is switching from natural gas to renewable energy sources, while a shortage of pipelines and export terminals for liquefied natural gas means that if sales to Mexico dwindle, there will be excess gas with nowhere to go. That gas will have to be flared, or oil drilling and production will need to decrease, a choice between increasing climate-warming carbon-dioxide emissions or decreasing profits. American refineries also face problems. Before the boom in shale oil production, refineries along the Gulf of Mexico were designed to process heavy oil grades from Canada, Mexico and Venezuela. Imports from Canada continue to increase, but they are limited by scarce pipeline capacity. Production in Venezuela is plummeting, and an expected ratcheting up of sanctions by the Trump administration could further hamper imports. 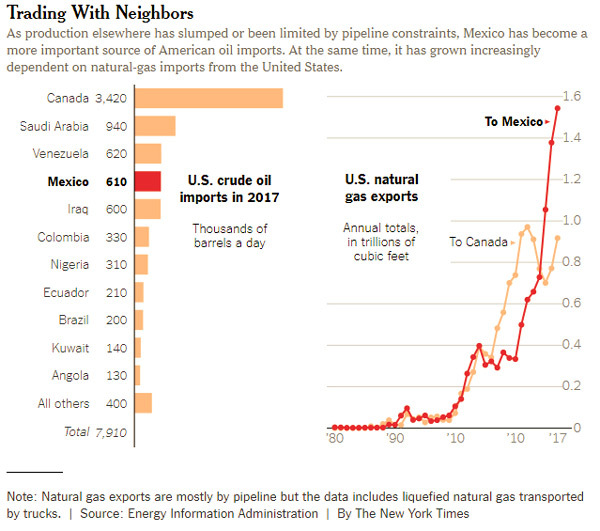 That makes Mexico, which accounts for about 8 percent of American crude-oil imports, an even more critical source. American refineries can process lighter grades of oil but much less efficiently, or they can undertake expensive overhauls of their equipment. Either way, profits would slump. Mexico, for its part, has been importing higher-quality transportation fuels from the United States, in an effort to clean up its cities' air. Last year, Mexico bought more than one million barrels of American petroleum products a day, providing $23 billion in revenue to American energy companies. Ms. Nahle, Mr. López Obrador's energy adviser, has said Mexico's own refineries can be retooled to handle a changeover from American gasoline and diesel. Mexican oil officials, expecting at least a slowdown of their policies, are holding offshore auctions as fast as they can to lure investment before President Enrique Peña Nieto, who is barred by law from seeking a second term, leaves office in December. More than 100 development contracts have already been awarded. The nation's oil production remains in decline, but officials hope they can reverse the trend as international companies begin to produce large amounts of oil in the Gulf of Mexico over the next two years. Independent energy analysts have viewed Mexico's moves as a model for economic development, and some worry about a reversal. “To make a U-turn from the current reforms would be detrimental to the Mexican economy,” said Fatih Birol, executive director of the International Energy Agency. Some oil executives and energy experts say they are not overly worried that the new contracts will be overturned. They note that Mr. López Obrador will almost certainly not have the congressional support to entirely rescind the constitutional energy change. Campaign oratory could give way to the realities of governing, especially when the oil industry offers financing for more social services. The government has earned signing bonuses of $525 million from investors so far this year as a result of its efforts. 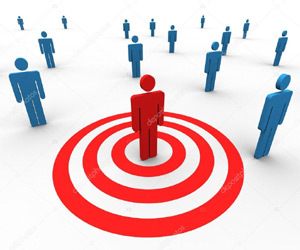 If necessary, international companies could focus less on Mexico and more on other Latin American countries, like Brazil, which also has huge offshore potential, or Colombia, which has significant potential for shale drilling. Both countries also have elections this year in which major candidates have expressed either opposition to giving foreign companies control over natural resources or environmental concerns about developing fossil fuels at all. Clifford Krauss is a national energy business correspondent based in Houston. He was previously the bureau chief of The New York Times's Buenos Aires and Toronto bureaus, and has reported in recent years from North Africa and the Middle East. In 2016, he shared the Society of Publishers in Asia Award for explanatory reporting.Petroleumworld does not necessarily share these views. Editor's Note: This commentary was originally published by The New York Times on April 25, 2018. Petroleumworld reprint this article in the interest of our readers and does not necessarily reflect the opinion of Petroleumworld and its owners.